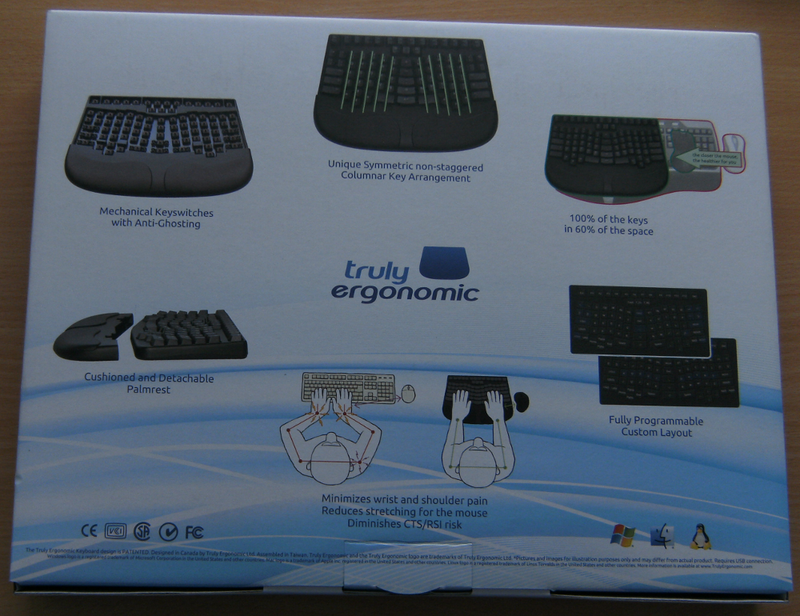 This post is a review of the Truly Ergonomic Keyboard (or TEK for short). This keyboard is very different from any keyboard that I’ve head so far. And since it is not exactly cheap (about 190 EUR or 250 USD!) I thought that I’d write about it so people who think about buying it can read some facts first. My last two posts were about closely related topics: 1) keyboards, ergonomics, touch-typing and common typist’s injuries and 2) alternative keyboard layouts. I’ve already made clear that I love my TEK there and in fact I’m so enthusiastic about it that I’m going to buy a second one for work as soon as I can afford it. With such a name the company won’t win a modesty award for sure! 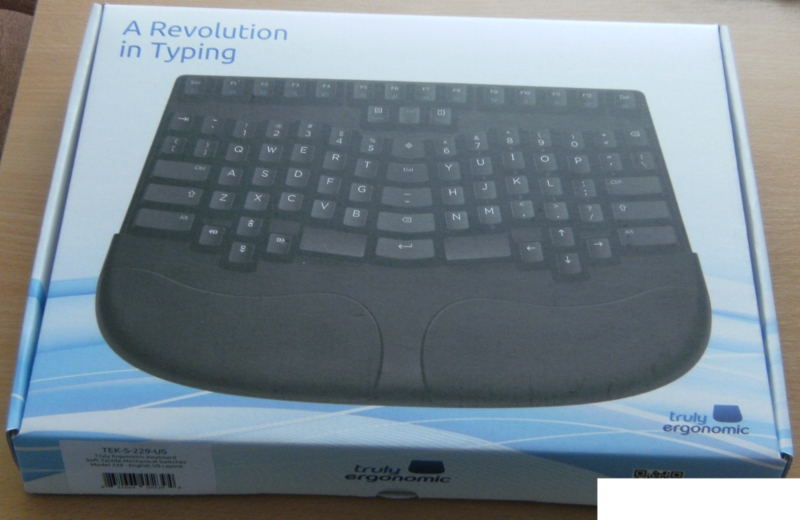 And the claim “A revolution in typing” is quite bold, too. But then again, there’s absolutely no need for being modest if you sell a product like that. IMHO this Canadian company could rightfully claim to have re-invented the keyboard or created a “keyboard 2.0” / “keyboard reloaded” or whatever you want to call it. There are just so many things about the TEK that I’m having a hard time to decide where to start. The company’s website of course explains a lot of things about the keyboard. I will of course mention everything that I deem important. But I’ll try to focus on my personal user experience with the TEK. 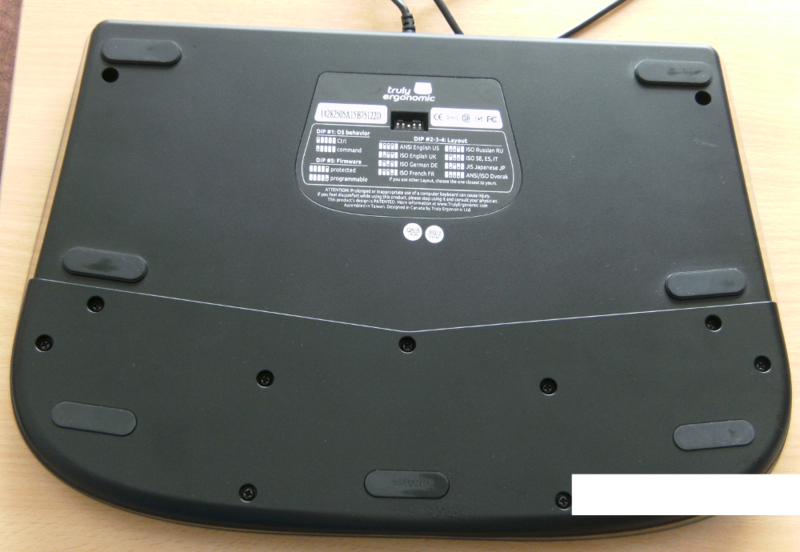 The dust cover that comes with the keyboard – a simple but useful idea! The first thing that you notice when you look at it is that the TEK reorganized the key positioning quite strongly. The letter keys stay in the same place compared to the classic keyboard layout. The same is true for the numbers, the Fx keys and the cursor (or arrow) keys. Same with Shift, Esc and so on. But this is more or less it. Leaving the letter keys in their common position is a good choice because the TEK asks enough of you when you have to re-learn a lot of positions for the other keys. Most importantly: Return, Backspace and Del move from right of the letter keys to in-between. They are placed right in the middle of the keyboard. This feels very odd at first because typically you’ve been familiar with a position to the right for many years. It takes a few hours to get somewhat used to it and, at least for me, it took more than a week to feel “natural”. The symmetric design makes the TEK look very nice. But aesthetics is of course not the real reason for such a radical re-design. Just as you would have guessed, the real motivation is – ergonomics! The little finger (aka “pinkie”) for example is much weaker than your other fingers. But instead of putting less strain on it, the classical keyboard requires you to use this finger for the Return and Backspace keys which are frequently used during the work day. Re-positioning these two keys so you can use your strong fingers for them makes a lot of sense from this perspective. The TEK follows a very different keyboard design! The Ctrl keys – required for a lot of key combinations – take the place of Caps lock and Return on the classical layout. Caps lock is a key most people use very rarely – if ever. Wasting the space of a nice big key for such a useless one is a shame. This is something not only the developers of the TEK have realized. There are some new laptop keyboards which simply remove the Caps lock key completely. The TEK moves it to the position below the Fx keys instead to make room for the left Ctrl. Moving the Pg up, Pg down, Home and End keys to the left as another cross like the cursor keys, proves to be an excellent idea. I used these keys less frequently before because they were not within direct reach from the home row. Actually I didn’t even pay attention to that and it only came to my attention after using them really often on the TEK (to e.g. go to the beginning or end of a line). Whenever I’m typing on an ordinary keyboard now, this feels lacking an important feature: Those four keys without having to move the right hand off the letter keys! Another useful thing (even though I don’t really use it) is the placement of the Fn key right below the Fx keys. You surely know this key from many laptops which however place it in the lower left corner of the keyboard. And that means you’ll need both hands to really use it (or completely over-stretch your fingers which is a very bad idea on the long run!). The Fn key on the TEK is in a much more reasonable position. There’s exactly one design decision that I disagree with: Making Tab a small key is not a very bright idea. And I’m pretty sure that more people will think the same in this regard. Tab – the key for auto completion on the terminal! – a small key… However this is not really a problem. Why? Just follow along and see. Annoyed by the Tab thing? Well, just re-map that key. No, no, you don’t have to go through the pain of configuring your xmodmap on Linux or figuring out how to do something like that in Windows if you use it (or are forced to do so). You also don’t have to re-configure your keyboard on every computer you might attach it to. Why? Because there’s the Custom Layout Designer where you can create your own layout with ease. Once you are done, you can download that layout and then flash the TEK’s firmware – so your changes are made directly inside the keyboard and thus completely independent of the computers you might plug it into later! This is an extremely lovely feature. Think about it: The possibilities to customize your TEK are almost limitless. For example I’ve mapped Ctrl back to the lower corners of the keyboard and put Caps lock on the former Ctrl keys (remember that I’m using the sophisticated Neo² layout which uses Caps lock to access other layers with different characters for the keys). I’ve also re-mapped Return to the left Space key because I feel that two of them are a waste of keys. And thus the former Return key, a nice big one in an excellent position, is free for mapping Tab on it! The layout designer is not only extremely easy to use. It also makes sharing your layouts a simple thing, since a link (a pretty long one of course) is created for it. View the layout that I use right now here as an example, if you wish. On the back of the keyboard there are some DIP switches. Click on the image for a bigger version to have a closer look. With these you can change between Windows/Linux and Mac mode, choose the base layout for some countries (or for Dvorak) and if firmware flashing is allowed. Mine is set to German (DE). The fully programmable custom layout is the one of the killer features of the TEK for me. There are only two things that I can criticize: For one the layout designer does not produce images with the current version of the firmware (v3.40 instead of v4.0 which the keyboard came with). I don’t know when they’re going to update the layout designer. For me it is nothing urgent as everything that I need works very well with v3.40 as well. The second point is the more important one for me: Currently there’s only a Windows program to flash the TEK’s firmware! Probably not a problem for a lot of people who have at least one Windows machine. I don’t. And since I didn’t trust Wine or wanted to flash from VirtualBox or something, I had to set up a Windows machine to flash my TEK. This made me do something I didn’t want to do again – ever. While having breakfast I installed Windows 2000 on an old laptop. Then the service packs, etc… Ok, I’ll skip over the details. The outcome was that I was able to flash the keyboard and I did so quite a few times until I was satisfied with the layout. Another pretty obvious fact is the very small size of the TEK. Truly Ergonomic Inc. advertise this as a huge benefit because the mouse can be closer to the keyboard – effectively reducing the way your hand travels whenever you switch between keyboard and mouse. I admit that I disregarded this point before I had the keyboard: There might be a theoretical benefit but it ought to be so little that you don’t ever notice it! Now I have the TEK and my mouse is much closer to the keyboard. Guess what: it feels good! I’m still using a Natural Ergonomic 4000 by Microsoft at work. And there really is a difference when it comes to a keyboard to mouse switch. It’s perfectly noticeable! So this is not just marketing after all. Less obvious is another strong point of the TEK: It uses mechanical key switches. In case you have no idea what this means I encourage you to do a bit of reading. 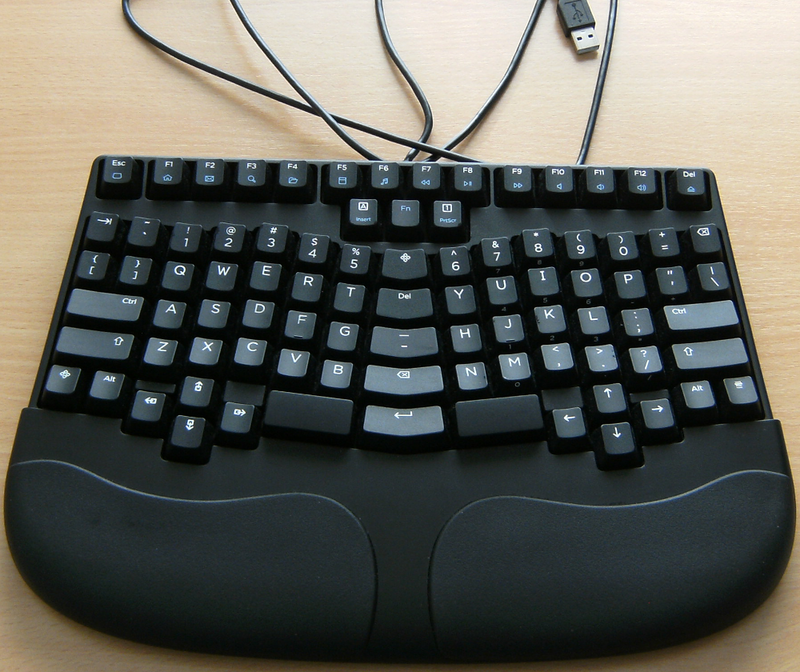 For short: Most standard keyboards use a “rubber dome” technique to trigger a keypress. This is cheap to produce and is of rather low quality compared to other types of keyboards. Mechanical keyboards use a separate and independent mechanical switch for every single key and the key triggers at the moment you press it about half the way down. There’s actually no reason to press it all the way down. And thanks to the switches the keys are what is called “tactile”. It’s hard to describe the real difference while typing. Try it out for yourself if you’ve got the chance. I’ve come to like the mechanical switches of the TEK and many other people love the switches of e.g. Das Keyboard, a popular mechanical keyboard that uses them as well. Another detail is that the keys of the TEK do not follow the standard key arrangement of placing them vertically staggered but in a straight line horizontally. In fact it follows the opposite approach – and this is a great idea! You won’t believe how much of a difference it makes if you didn’t feel it yourself. Our fingers do not all have the same length. The key arrangement of the TEK honors exactly this fact. The TEK is advertised to be compatible with Windows, OS X and Linux. I’ve also used it together with FreeBSD and OpenBSD – just like you’d expect everything is fine of course. Before purchasing this gem I read quite some reviews of course. There were complains from people who had problems with the so-called “ghosting” and such or needed to “type in” their keyboard before everything worked right. I never had such problems. My TEK worked from the moment on that I first connected it to my PC. But then again this was most likely an issue with the old 207 and 209 models and seems to be solved with the 229 that I own. The only real problem that I noticed was that the embedded Num Pad (which can be switched on and off) behaves strangely and is not of much use. Since I don’t really depend on it, I simply don’t use it. However for some people this may be a total no-go. This is probably fixed by the firmware v4.0, but I didn’t try it out. It’s much more of a shame that the TEK is only offered with an US layout. Again this is not much of a problem for me. But my wife is not happy with this at all. And as you can all imagine, this is NOT good (and does certainly not help to convince her that I need to spend so much money again to buy a second one!). Would be great if you could choose between some common keyboard layouts. I’d even be willing to spend some more money for a German one! Another thing is the detachable palm rest. I like it the way it is and never attempted to take it off. But I think for some people it may be nice to have an even smaller keyboard. Depending on what you prefer, there are different models of the TEK. One model with wide Alt keys (model 227) which Emacs users will love and one with two normal-sized keys instead of one wide Alt (model 229). And then there’s an “MX brown”-compatible (soft tactile) and an “MX blue”-compatible (clicky tactile) version of either model. I’ve got 229 brown and that’s loud enough for me (at least until I finally learn not to push the keys down to the bottom!). The TEK is not a keyboard for everyone. It is too expensive for many people and too different from the style everybody is used to. But for people who type a lot, who are willing to invest a bit of time to re-learn things and who take advantage of its special features (like the customizable layout), it is pretty close to the ultimate solution. It is well-thought-out in just about any area. 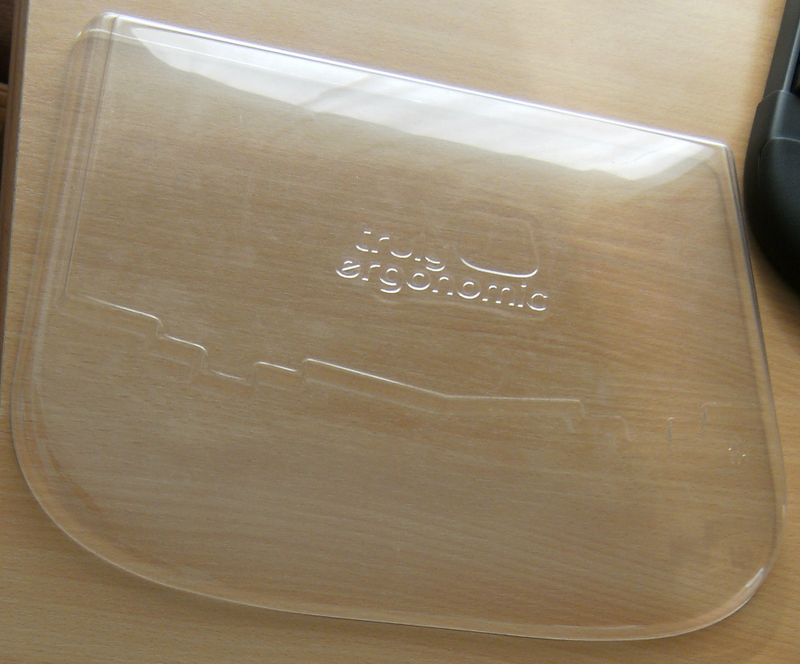 A plastic dust cover for example is such a simple yet very effective thing! The flaws that the TEK has are very few and mostly nothing too problematic. A choice between the US layout and some others printed on the keys would be my biggest wish, closely followed by a flashing software for Linux. However I guess that an updated layout designer to feature firmware version v4.0 is more likely – and of course I’d appreciate that as well. Perhaps some of these wishes might come true if the TEK reached a much wider audience. Maybe even the price could be reduced then so that again more people could afford it. Ergonomics is an important topic when it comes to progress in the IT field. The TEK is not the only keyboard which tries to implement ergonomic considerations. But it is a very good one. If you consider doing something about Ergonomics, to get a new keyboard and try out an alternative layout like Neo², Colemak or Dvorak, I suggest learning the alternative layout first. Trying to get used to a new layout while trying to adopt to a new keyboard will almost certainly fail. And learning a new layout is by far the bigger task – so it makes perfect sense to learn it on the keyboard that you are used to and make the switch afterwards.